These are my entry for the 2018 mallet swap. My recipient was Mr. Wilson of Wilson_woodworking and he seemed well pleased with what I built. I thought, “mallet swap, this is going to be easy”. I was wrong! Like all new projects to me there was a learning curve. My first mallet was a joiners mallet. I laminated maple, cherry and a mystery (to me) hardwood and used the lathe to form it. The handle is oak. 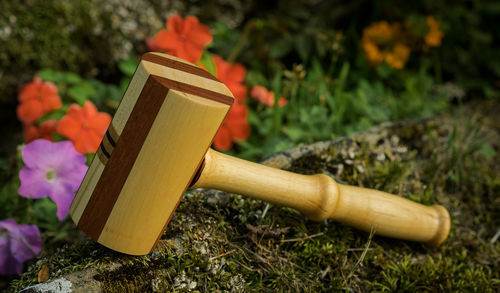 While making this mallet I had a bit of an injury and was down for awhile. I almost dropped out but was finally able to finish it. After finishing the first, (and feeling better) I decided to make one a bit larger. I came up with this one, a lamination of hard maple and the same mystery wood. I made the handle from some spalted maple (also very hard) I had set back for a long time. After seeing these two, I wanted to do one more for a set. I had some walnut recovered from a neighbors tree and chose this for a carvers mallet. There were many attempts before completing these three and lots to learn. Such as handle shape. I would carve a bit on the lathe, stop, see how it feels and then continue until it felt right. This was a fun swap and I want to thank Neil for overseeing all of us and everyone for taking part. Excellent work Jeff. Every one of those look like users that I’d love to have in my shop! Glad you stuck it out Jeff! These turned out great – and your photography is phenomenal! They look great Jeff. 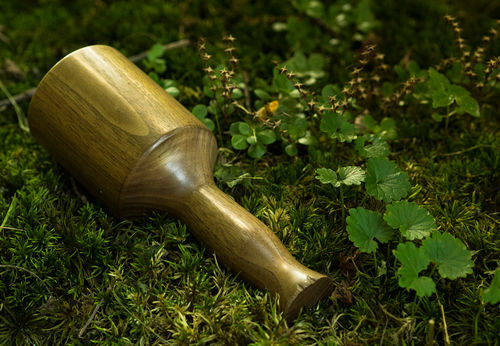 A mallet for every purpose with a cool combination of wood. I hope your injury wasn’t the carvers mallet flying off and hitting your head. That would leave a mark. Nice work buddy. While the joiner’s mallets are nice, I have to say I like the carver’s mallet the best because of the grain. Is it all one piece? What kind of wood? Did you stain it? I’m glad that you were able to recover from your injury and finish the swap. Take care of yourself. We want to see more of your work. Super job Jeff! They make a great trio. Thanks for all the nice comments everyone! I appreciate them. Ken-Thanks buddy! Just remember who gave me my first lathe lesson! :-) Coming from you, that’s awesome! Mike-Thanks! I can’t take credit for the photography. My Son does this for a living and does all my photo work. He makes me look good! He even has photo work for many others on LJ. Dave-Thanks buddy! No, nothing flew off but it did involve my lathe. Where I have to take it outside to use it, I pulled a bunch of muscles in my back carrying it. Motrin and time. Earl-I too like the carvers mallet. Back in the late winter my neighbor cut down two walnut trees. I got a bunch of the wood! :-) It seasoned nice. Yes it is one piece. Bill-Thanks guy. I like them but your set was off the charts great! Tony-Thanks buddy. I’m glad you too was able to complete the swap. Ivan-Thanks buddy. Glad you like them! Awesome job Jeff! Wouldn’t mind that same set in my shop! They all look good and functional. Thanks Dave, I really like your damascus work! Beautiful work. It’s on my to do list. 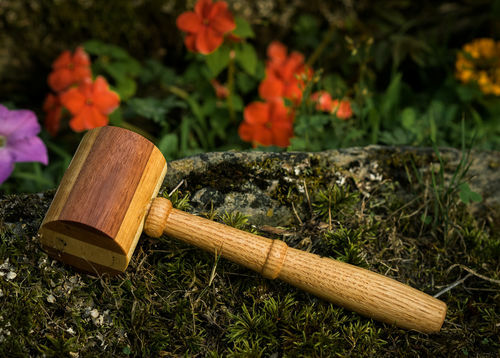 I love the carvers mallet. Your segmented work is very attractive. Fit and finish look perfect, Jeff. Great job, Sir. Really like those mallets Jeff, especially the handles. Thanks everyone for the nice comments! I had a blast in this swap and really learned a lot!